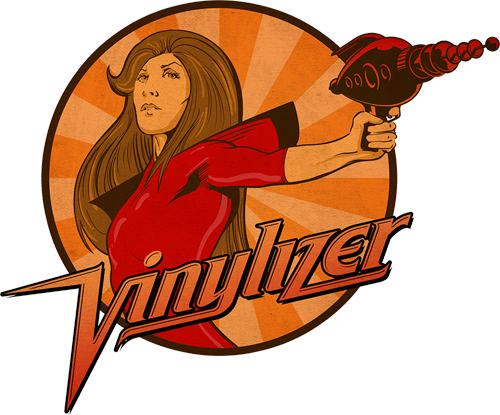 Once your audio has been prepared for vinyl, a master lacquer must be prepared. Lacquers are made out of an aluminum plate that is coated with thin nitrocellulose lacquer. Your audio is physically cut into the surface in real-time to produce a "master" image which will be used later in a process called electroplating to create the actual stampers used to mould your final records. Each lacquer is single- sided and is cut separately. A full album with music on both the A and B sides will have two lacquers. A cutting lathe with a special cutting head and stylus are used to cut the lacquer. The stylus is made of sapphire. Once heated, it cuts a spiral V- shaped sound groove into the lacquer based on the vibrations made from the sound. The depth and width of the groove depends on the intensity and volume of the music. Electroplating is the name given to the galvanizing process that creates the A and B stampers from the lacquers that will fit to the record press and mould your records. One set of stampers generally has a life span of producing approximately 750 – 1000 records, so extra stampers are necessary to complete larger runs. Once the A and B stampers have been prepared to fit the press, you can then proceed with your test pressing. Test Pressings are a white label sample run of approx. 10 units that can be checked and listened to before the final pressing. Test pressings are highly recommended for orders of 500 units or more, but in order to speed up your order or cut costs, you can opt out of the test pressing process by sending a test press waiver. If the customer orders test discs and then decides to make a change to the master AFTER the test pressing is received, additional charges will apply for new lacquers and stampers.